Geneen Roth is known for her books about food; mainly about how to stop compulsive eating. She holds workshops and retreats about eating habits and food, but turns her attention to money after she loses her life savings in the Bernie Madoff scandal. She discovers that her behaviors behind the way she handles money are similar to how she used to behave with food. This is quite a revelation for her. She writes, “Do we really have to keep repeating the same patterns over and over? 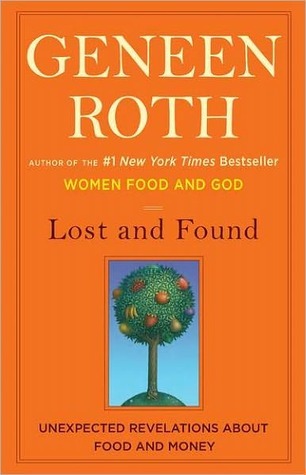 In this book, Roth explores her relationship with money. She determines that the way her mother and father treated money as she was growing up has much to with the way she treats money. Money is a mysterious thing to her; it is as if she acknowledges that she has plenty of money that she is not the wholesome and spiritual person she wants to be. So she ignores money. She shoves it into the account that Madoff has control over, and then loses it all. To be honest, as I was reading this book I felt like Roth comes from a very different place than I do. She writes about her grandfather “who had his silk underwear embroidered with his initials at Sulka, despite the fact that they were barely scraping by.” (p. 35) This is a far cry from my own modest upbringing. I don’t even know what Sulka is, but I assume it was an upscale store. Some of Roth’s revelations about money are valuable lessons, and we can all learn to be more aware of where our money goes and how to pay attention to our spending habits. Join the Lost and Found Discussion at BlogHer Book Club! Disclosure: I was compensated for this BlogHer Book Club review but all opinions expressed are my own. Growing up, I heard about the Depression from my grandparents and watched my grandmother save everything of use. I am very much like her now, choosing not to spend frivolously on anything, especially when John lost his job. I hate how we depend on money for everything, but it is a necessity to get by, so I respect it as well. It's hard to really get into a book when you can't relate to the main character, whether that person is real or fictitious. My recent post Easter Cupcakes! Hi, I stumbled across your blog through "Laugh with us Blog Community". I saw that you fought breast cancer and lost your mum. I have been caring for my mum for the past 2.5 years, she has battled stage 4 breast but is still fighting at 86. Its a rocky road and I know what you would have gone through with your mum. I am interested to know did you develop breast cancer after you lost your mum or before? My mum has not given up yet and still battling although getting frail. On the positive note, my mothers friend is 85, she beat breast cancer twice first time 30 years ago, 10 years ago she has part of her lung removed (she was a smoker), and she is still going strong and did a trip to the UK last year. My recent post Red Velvet Cupcakes – Finding Out What The Fuss Is All About!